Do you remember Gary Cobb? Gary Cobb graduated in 1956 and was inducted into the Hall of Fame in 2019. 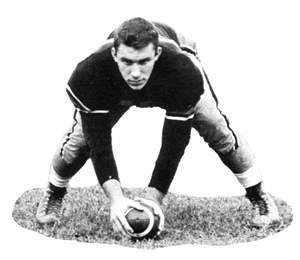 Gary Cobb, 1956: Gary was a four-year letterman in football and track. He was named captain of the football team in his senior year and was named All City and All State center. His senior year, the team was named City Champions. He went on to play football at Miami University; he was a center and nose guard for three seasons and earned All MAC recognition. In his senior year, he was named to the Little All American team. He holds the distinction of being the first Tiger to be on a football card after joining the newly-formed Buffalo Bills professional team. After his years in the AFL, Gary returned to Cincinnati, where he served as an assistant coach at Walnut Hills and head coach at Western Hills.